Home » Beadwork » Beaded Patches & Strips » Multicolor Bead Strip, 2" X 32"
Notify me of updates to Multicolor Bead Strip, 2" X 32"
Multicolor Bead Strip, 2" X 32"
Hand beaded seed bead strip. 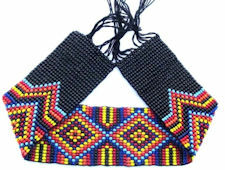 These Southwest Native American style beaded strips measures 2 inches (5.08cm) by 32 inches (81.28 cm) long. They are beaded with tiny 11/0 seed beads. This beaded strip can be sewed, or glued onto material, leather, wood, etc. Use this bead strip on your tribal regalia, a coat, purses, shoes, hat, guitar straps, horse bridles and dog collars, etc, for an easy and beautiful decoration.